That good dude ANDREW WESTBURY of ELDICA RECORDS in DALSTON has collaborated with MAIN ARTERY to produce a very special limited edition print of forty five funk 45s. Now anyone who knows ANDY or has been to ELDICA will know that this man has a enormous knowledge of funk records and I can imagine a breathtaking collection of 7" vinyl. The print features 45 super rare Funk 45's which have been carefully selected by ANDY with only the best of the best in mind. 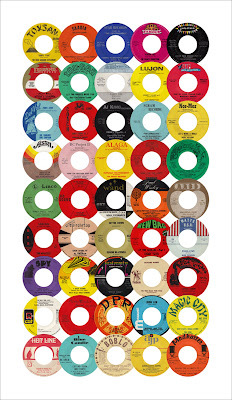 Some 45's on this print can fetch up to £500 plus! This run of prints is strictly limited to 45 editions only, and exclusive to Main Artery Prints. If you love your funk like I do then order a copy through the MAIN ARTERY website. Click on the picture to take a closer look at the 45s ANDY has used for the print - I guarantee you won't own all of them, but we have some classic records like "Iron Leg", "Humpty Dump", "Space Funk", "Gettin Down" and "Jason Pew Mosso pt1" to name only a handful. Check it out funk fans!! Some amazing 45's on there. I spot about 4 that I own. The billy Larkin (second row,center) is a killer. Has anybody sampled that yet? And the Larry Ellis has been on my'wants' for years.Although i have passed up 2 copies over the years. One day..